Sony NWZ-ZX1 review | What Hi-Fi? For a lot of people, smartphones have become the default choice for portable music. They’re convenient, after all, and not everyone wants to carry multiple devices. But some of us still want music to go on a dedicated device that places audio playback above all else. That’s where the Sony NWZ-ZX1 Walkman comes in. 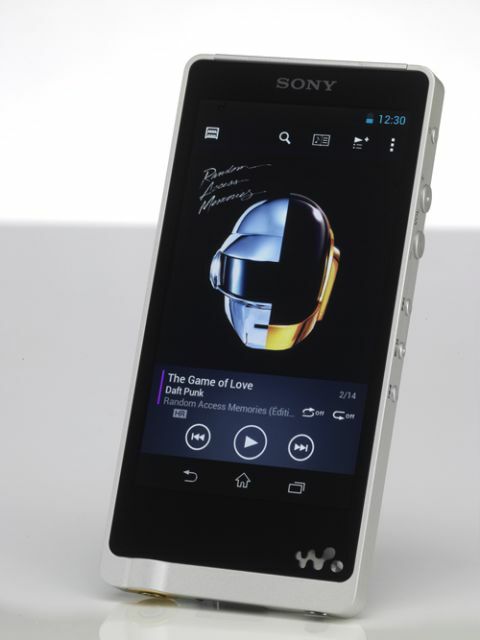 It is Sony’s latest flagship Walkman, capable of playing high-res music as well as your standard CD-ripped tunes. The ZX1 makes one hell of a first impression. It’s a solid, weighty unit with a frame machined from a block of aluminium. The front is glass, the back is rubbery leatherette – which looks quite smart and improves grip. The level of design and build most certainly matches the price tag. This Walkman has an unusual shape – a thin slab for the most part, but with a prominent derrière. This houses the amplifier block, and also makes the unit easier to handle. Sony has gone against Apple’s sleek and slim design philosophy, perfectly happy to feature hard edges and protrusions. In line with this attitude is the bottom edge of the device, which seems proudly asymmetrical. There’s a loop for lanyards (that’s a big deal in Asia), a proprietary charge/data port/USB output, and a 3.5mm headphone socket in the middle of a gleaming brass cylinder. This cylinder is so big it rises slightly above the face of the ZX1. It allows internal cabling to be a little thicker, theoretically improving sound quality. Sony says the larger jack results in lower contact resistance. Sony has recognised that touchscreens aren’t everything, and to this end the ZX1 has physical buttons along its right edge. These are nice to use, and not big enough to catch on bits of clothing. No more turning on the screen to change tracks – you can do that in your pocket. This makes us very happy. Overall, it’s a striking design, and we really like it. Sony has clearly tried its best to make the ZX1 different to anything coming out of Cupertino. The device looks like it means business, and the luxurious build quality reassures us of that impression. You get 128GB of onboard storage, and out of that just under 115GB is free to use. You’ll be able to fit about 60 high-res albums on there. We loaded up nine albums and it took up 17GB. There is no expandable memory slot, so serious users with large libraries of exclusively high-res audio tracks will find this a bit tight. We reckon it’s a decent amount of storage for most people, but it’s definitely an oversight not to have expandable memory. Sony has however told us it is looking to introduce SD card slots elsewhere in the Walkman line-up. The 4in VGA screen has a resolution of 854 x 480 pixels. This is the same screen size as a fifth-generation iPod Touch, but Apple’s player has 1136 x 640 pixels. Numbers aside, the Sony’s picture has less detail and subtlety, even if it’s more than good enough to navigate the device. In any case the screen is too small for any serious viewing, and it’s clear that music is the priority here. Turn the device over and you’ll see a Walkman logo, which is actually a tiny speaker. It’s clearly not designed for serious listening. Above that is a symbol denoting NFC (Near Field Communication), which can be used for easy Bluetooth pairing. Note that high-res performance is only available through a wired connection. File transfer is a simple matter of dragging and dropping, without the need to faff about with a particular program. Lovely. The default Sony Walkman app has a nice interface and quite a few equaliser modes to play with, but if you’d rather use third-party software such as Poweramp, the Walkman’s Google Play store access will see you right. Audio compatibility is pretty good: MP3, WMA, ATRAC, ATRAC Advanced Lossless, WAV, AAC, HE-AAC, FLAC, Apple Lossless and AIFF formats are all supported. DSD files are not supported – you’d have to convert to Linear PCM first. This strikes us as a little odd as Sony is the major force behind the format. Sony says the plan is to introduce DSD compatibility in later models. But for now, you’re out of luck. Battery life will vary depending on the way you use the device, but Sony claims a music playback time of 32 hours. We managed to get three days out of it with moderate usage (music only, no wireless extravagance). Listening periodically during a 10-hour flight knocked the battery down by 15 per cent. We didn’t waste any time in loading a selection of high-res tracks up to 24-bit/192kHz. The ZX1 is a properly talented performer, delivering a refined performance with plenty of subtlety. Details and textures are layered and well organised on a wide-open soundstage. You get a high level of precision and agility, with excellent timing and punchy dynamics. Tonally the sound is well balanced, but the articulate yet hard-hitting bass deserves a special mention. We switched to WAV CD-rips of the same songs and noticed a minor dip in detail and subtlety, but not enough to dampen our enjoyment of the performance. These tracks benefit from the same polished, engaging presentation as their high-res FLAC counterparts. Next we tried the same files on an iPod Touch, and it sounded brash compared with the ZX1. We’ve always raved about the Apple’s performance, but the Sony was ahead at every turn, offering greater subtlety with better timing and a greater dynamic range. The only issue we have is the volume. It was loud enough for us listening in the office, but that ceiling could still be a little higher. We should point out that there aren’t any bundled earphones. All you get is a cable, a slip case and a tiny wedge of plastic in case you simply must have the player level with a tabletop. You wouldn’t want to use this with cheap, bundled cans anyway – the ZX1 deserves proper listening. We used the excellent AKG K550s and Beyerdynamic MMX 101iE. We really like the Sony NWZ-ZX1. It is a brilliant first attempt at a premium high-res audio player. Purely in terms of audio performance, it is the best portable music player we’ve reviewed. It’s not just about sound, though: its price tag is a little hard to justify fully when you consider its lack of expandable memory and DSD compatibility, and its mediocre screen. We look forward to seeing Sony address these issues, but in the meantime, Sony can be proud of itself. High-res tracks kindly provided by HDTracks, which is launching in the UK in Q1 2014.